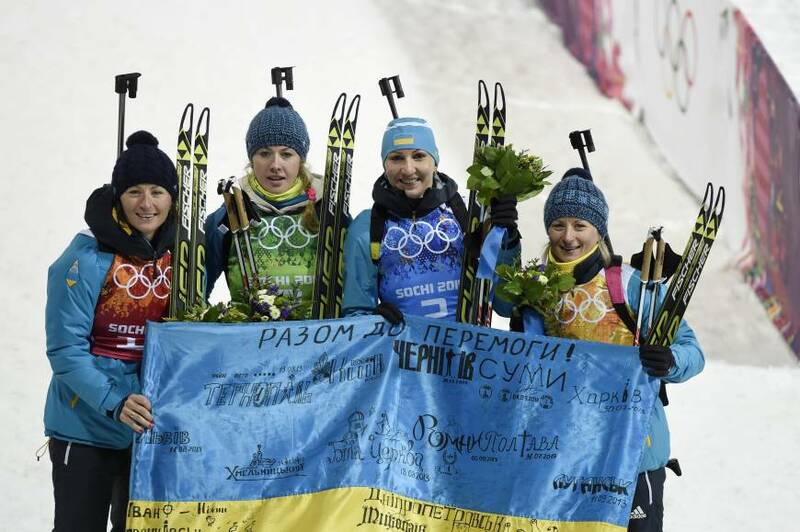 KRASNAYA, POLYANA RUSSIA - Four teammates stood proudly behind the Ukraine flag, smiles beaming, celebrating their country’s first gold medal at the Sochi Olympics. Parliament paused in the deeply divided Ukraine to mark the occasion. 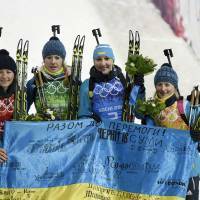 After days of deadly anti-government protests, and as government and opposition leaders worked on a political solution to the months-long crisis, the Ukrainian women provided some good news with their victory Friday in the 4×6-km biathlon relay — Ukraine’s first Winter Olympics gold medal in two decades. It was a momentum shifting day for Ukraine, with Parliament voting to restore the 2004 constitution that limits presidential authority, clawing back some of the powers that President Viktor Yanukovych had pushed through after being elected in 2010. Twins Vita and Valj Semerenko combined with Juliya Dzhyma and Olena Pidhrushna to win the last women’s biathlon event at Sochi. There were tears, and then there were smiles. At a news conference an hour after the race, Pidhrushna urged a room full of people to stand for a minute’s silence in memory of the people killed in the protests in Kiev. Pidhrushna hoped the victory had a unifying influence. The biathlon victory was warmly welcomed by protesters on Kiev’s Independence Square, known as the Maidan, the scene of street battles between protesters and police earlier in the week. Dozens of people were killed and more than 500 injured in confrontations between government forces and protesters between Tuesday and Friday morning. “The news has lifted our spirits after yesterday’s nightmare,” another protester, Vasyli Kosholynski, said. Ukrainians in Sochi celebrated the victory. “I think the situation in our country will be better for this moment,” said Zlatov Aleksander Sergeevich, a Ukrainian who studies in Moscow. The Ukrainian team missed five targets but avoided penalty loops to finish in 1 hour, 10 minutes, 2.5 seconds. Defending champion Russia was 26.4 behind to take silver, and Norway trailed by 37.6 to win bronze. It was the second medal for Ukraine these games, after Vita Semerenko took bronze in the women’s 7.5K sprint. Germany failed to reach the podium in an Olympic women’s biathlon relay for the first time since the sport became part of the Olympics in 1992 on a day the team was rocked by a doping scandal involving Evi Sachenbacher-Stehle. Germany was the top-ranked women’s relay team but Franziska Preuss fell and lost a pole on the first lap, and lost even more time when she had to blow snow out of the sight of her rifle before starting her first shooting. Germany finished 11th, more than three minutes off the lead. Franziska Hildebrand, who skied the third leg for Germany, said the team was told about the doping test earlier in the day. Hildebrand and Henkel both said they had not spoken to Sachenbacher-Stehle since the positive result was announced.